He says his dual citizenship is no secret. A man who was seen displaying a flag of the self-proclaimed separatist Donetsk People's Republic (DPR) during the yellow vest protests in Paris has said he holds dual citizenship of France and Russia. 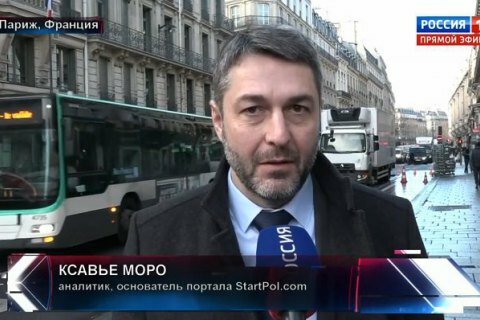 The man, who was identified as Xavier Moreau, was speaking on the air of the 60 Minutes show on the Russian propaganda Rossiya 1 TV. He was trying to dismiss the allegations that the USA instigated the unrest in France. “The yellow vest movement in France is an anti-Maydan. It is fully spontaneous and autonomous. Neither Trump nor the State Department nor [Russian Foreign Minister Sergei] Lavrov brought any cookies… I am a member of the yellow vest movement and will stay so for as long as Macron remains president,” Moreau said. He added that he did not make a secret of his Russian citizenship. “I am a citizen of France and a citizen of Russia. I have never kept it a secret. I can even say that I am proud to be a citizen of the greatest country on Earth if you want to hear that. And my wife and children also have dual citizenship,” he said. The French government is checking reports about Russia's possible involvement in the yellow vest protests. The Times earlier quoted a research by the New Knowledge cyber security company which found out that "hundreds of social media accounts linked to Russia have sought to amplify the street protests that have rocked France". The Alliance for Securing Democracy said some Russian state-controlled media actively supported the yellow vest protesters in social media.